I awaken early on Thursday, perhaps to make up for my sloth of the prior morning. Up at 6:30, I head for the pilothouse to wrap up in a blanket and catch the sunrise. Suffice it to say, it’s another British Columbia day, grey and cloudy, with no sun to be seen. But the best part is that Bob and I don’t care, because it’s so great up here, the weather is secondary. Boats start leaving from Rebecca Spit quite early, off to catch the tides to somewhere else. We have no need to leave until later in the afternoon, so we had a truly leisurely morning. Having decided we needed not only a motorized dinghy but also a kayak for this trip, it was time to test our kayak out. We rented a 17’ double kayak, which Bob said was because “if we get into trouble and get caught by the current and swept out to sea, at least we’ll be together.” Nice sentiment! Anyway, we decide it’s a grand and windless morning to try out the kayak thing. Kayaks ride quite low to the water, so we had some fun doing gymnastics to get into the kayak without falling overboard. Actually, it wasn’t too bad. And due to the luck of who fits best where, I get to sit aft, with the rudder controls. It also means that I get to critique Bob’s strokes and paddling technique, while he can see nothing of my mistakes. I like that. We had a great paddle, but I’m sure we were amusing the natives. We could not seem to figure out how to paddle synchronously. Of course, we ARE two only children, so we each wanted to do it our way. Nevertheless, we skirted the shoreline and saw lots of shells and purple starfish (those are really cool) and generally enjoyed ourselves. Returned to the boat without incident, either. Rebecca Spit on Quadra Island is a lovely park. 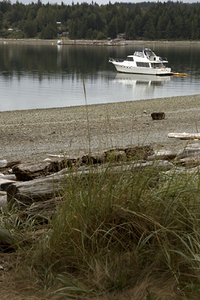 Quadra is the largest of the Discovery Islands with a year round population of only 2700. The spit is formed by Heriot Bay and Drew Harbor on one side and the Strait of Georgia on the other. The spit is narrow and has great walking trails and rocky beaches. 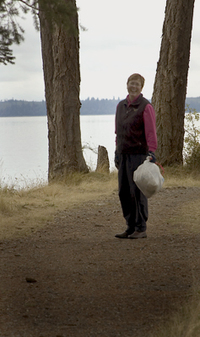 Karen makes a "legal" trash run at the park on Rebecca Spit. Low tide at Rebecca Spit. Our float plan for the day is to go through Surge Narrows (one of those frightening narrows that has strong currents and riptides and back eddies, so it needs to be transited near slack water) and onto the Octopus Islands, one of my most desired destinations. We missed the Octopi last year because we ran out of time, but this year I have 2 nights scheduled. We retrieved our stern lines without incident and headed up toward the narrows with enough time to stop in at the infamous Surge Narrows store. This is an old fashioned store with goods piled up on shelves, run by nice people and with just enough dock space for us to squeak in. Surge Narrows store in all it's glory. Not impressive from the outside, but full of what a boater wants and needs. Best of Times viewed from the Surge Narrows Store. Careful not to walk down the "wrong side" of the docks. There is a post office on the opposite dock open three days a week. We saw a local fellow run over in his dinghy to pick up mail at his mailbox, right there on the dock. Wild. The "Post" at Surge Narrows. The transit through the narrows was uneventful. Guess that’s good? The approach to the Octopus Islands is narrow and rock strewn, but Bob with nerves of steel had no problems. I expected to find the anchorage crowded, but we are currently anchored with only 2 other boats and we feel lucky to be in this pristine and very quiet place without a lot of neighbors. What a great place to relax, and tomorrow another kayak excursion is planned. At last, we reach the fabled Octopus Islands.